Paul Dorn knows that getting Americans to ride a bike to work instead of driving a car is quite the uphill battle. Even on a good day, he says, only a tiny percentage of the nation’s commuters use pedal power to get to their jobs. Given that this is national Bike to Work Week, it’s an apt time to pick Dorn’s brain on the subject. 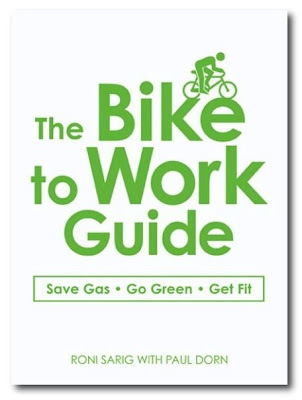 Between co-authoring a book (The Bike to Work Guide: What You Need to Know to Save Gas, Go Green, Get Fit ) his bike commuting advice Web site and his commuting tips blog, he is well-versed in the subject. "I'm fairly typical of most Americans in the sense that the day I got my driver's license, the bike went into the garage. I didn't really touch it again until my mid-30s, when I was living in San Francisco, and didn’t have a car," he said. His frustrating mass transit commute took 90 minutes. So he hopped on a bike, cut the commuting time in half, felt healthier, stopped paying bus fare and just generally started having more fun. It's Bike to Work Day in many cities across the U.S., including the San Francisco Bay Area. (BTWD in Sacramento is May 21.) This extensive article offers insights--many of them mine--into bike selection, bicycling safety, and advocacy for complete streets. Bike to Work Day has been an effective promotion, encouraging commuters to reconsider their default transportation mode. A major challenge facing many prospective bicycle commuters is what we might call (with a nod to James Howard Kunstler) the "Psychology of Previous Investment." Motorists have made a huge investment--social, psychological, emotional, and financial--in their automobiles. "I love my car" or "My car makes me look hot!" They've made payments on car loans and auto insurance. They are afraid of diminished social status: "Jeff's not driving, I wonder if he lost his job?" The characters on their favorite TV dramas and sit-coms drive; their friends, family, neighbors, coworkers, everyone drives. Cars evoke nostaglic memories; our parents took us on car trips, not bicycle tours. There's also the perception that bike commuters are either eccentric geeks or low-income transients. It's not mature or grown up. Our entire culture has been built around the automobile. While the rest of the world built transit and high-speed rail, we built freeways and parking lots. In much of our country, it is truly unpleasant to walk or bike to destinations, which in sprawling suburbs are often separated by long distances and dull numbing strip mall streetscapes. In short, our public policy for the past 60-70 years has discouraged walking, transit use, or bicycling. It's a challenge to consider shifting to bicycling. Bike to Work Day is effective at raising awareness, as individual commuters and as citizens in a culture long-dominated by the auto-petrol industrial complex. BTWD offers a "safe" day to try bicycling, makes us confront our transportation reality, and causes us to examine our real options. And a few of us will try bicycle commuting, and possibly continue with it. Happy Bike to Work Day. 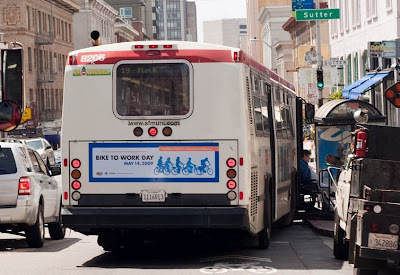 Image: San Francisco Bike Coalition. Gonna be 70 degrees in Portland tomorrow for Bike to Work Day. We'll have us some wonderful bike traffic jams no doubt. Yippee! I remember feeling inadequate because I couldn't afford a car. In Germany the 'Car=status' thing is as strong as the US: You're a real inadequate if you don't own a vehicle. I think a great step toward bridging the gap between Car commuters and bike commuters is to find a way to let the car owners keep their cars, keep their status, while still riding. I've found that by having a folding bike in the trunk of the car you can ride to 'safer' areas, pull out the bike, and ride the rest of the way in. It's a great way to introduce bike commuting while not making people feel they've abandoned their cars. It takes care of the distance argument against bike commuting too. I've been doing it for 5 years on my SwissBike LX and love every minute of it. I heard you on Insight today. Great job. I've been following your blog since 2006 when I started bike commuting. Thanks for your "insight". I feel a special connection to you. 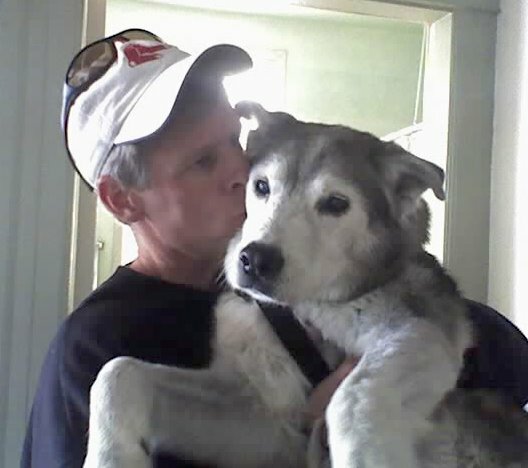 In 2006, I moved to Davis to live and work; and I began bicycle commuting. In late 2009, I moved to San Francisco. I continue to bike commute. I live in Ingleside Terraces near SF state and work in Civic Center off of Van Ness. Anyways, in the morning, I bike to Balboa Park and get off at Civic Center. In the afternoon, I ride all the way home. What a liberating feeling. What a great way to finish the day. Anyways happy cycling. Thanks for all the help along the way. Happy cycling. @patrick: Thanks for your kind comments. The streaming audio and podcast of my appearance on "Insight" is available at CapRadio.org. I'm on at about minute 19. I think more people would bike to work if they realized that a low-speed short-distance bike commute is not really exercise. Between cars at the moment and only 2.5 miles from work. Bike ex-husband bought for 18 year old daughter for Christmas (who went bike? ), so I started riding to/from work. (Previously I walked or rode with co-worker) Now about 5 months later, I am riding every day to work, running errands and looking for things to do on my bike. I'll be 52 in September and looking for a replacement bike. This WalMart street cruiser just can't cut the North Carolina hills I have to ride/walk up. Once I started riding and walking (for my health) it amazed me to see exactly what was within a short ride/walk from home. I live in an apartment complex right behind a little strip mall with a grocery store. I takes me just as long to get in the car, drive over, park, shop and come home than it does for me to ride over. This fifty-something is a biker babe now! Is there anyone out there who can give me some feedback on the best bike route from Pasadena to Chinatown? I would like to find a car-free way to go. I am also considering the Gold Line. Google Maps suggests two routes - via Huntington Drive or via Figueroa. Anyone have any idea which is better? My commute is around 15 miles, there are plenty of people with shorter commutes that drive. Hopefully a culture shift will occur and more people will begin to cycle to work, but id bet that you have to pry the steering wheel from the majority of americans hands. For the person that suggested driving part of the way then riding the rest, im always happy to get more people riding, but driving your bike around seems pretty backwards to me. I suppose if thats what it takes to get people to ride, but it seems like a waste to me. Piss on cars. I really appreciate your eloquence on the topic of 'previous investment.' Thank you for putting the idea out there that we don't all have to depend upon our cars. I just discovered your blog and look forward to perusing your archives! Really good point about the investments that motorists make; it's such a barrier to persuading people to change their attitudes. The fact that the car is so ingrained in TV and movies makes even considering cycling to work (or wherever) unlikely. I'm all for riding a bike to work, especially in good weather. You get to wake up, feel good, lose weight, and even work better. I don't think, however, that a lot of people are aware of these benefits. Unfortunately, a lot of commuters in my area arrive at the train station in a car. Only a small minority rides directly to the train or even to a job. Just stumbled upon your blog. Very nice! Have any good suggestions or links for bicycling in the cold/snow? I'm in the Navy on active duty, and until recently was stationed on the lovely tropical island of Guam. I typically worked 12-14 hours a day, 6-7 days a week unless I was deployed. I lived 17 miles away from work and rode rain or shine, day or night, 98 degrees in 98% humidity, sober or hungover, for three years. I sold my car for a 6-pack at one point. I rode one of two 300 dollar Giant Yukon SE... after i had rode my 90 dollar K-mart special into the ground. The happiest parts of my day were my commutes and a beer in the shower after getting home. It's sad that people will spend half a year's salary on a car, and a month or more's pay a year for fuel and insurance, and a day's pay for a gym membership when they could be putting that money into partying and working the resulting beer gut off on the cheap. Yes, I own a car, but I’ve been considering biking to work for a while now. I wasn’t able to get to it right away, though, due to considerations (or excuses, as you say) such as the discouraging lack of proper bike lanes, among others. No more excuses now. I’ve got a question, though—what do you usually wear as you bike to work? I’m guessing something along the lines of this http://www.s3performance.com.au/shop/apparel/road-bike-gear/kevlar-jeans/120303? I want something that can be appropriate for both work and biking. Unfortunately, cycling shorts isn’t suitable for the former.